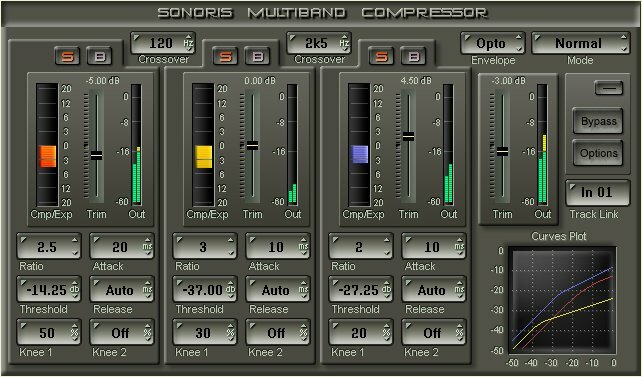 The Sonoris Multiband Compressor is a versatile multiband compressor suitable for mastering or mixing. It is a very transparent compressor that can also have some character if needed. The Sonoris Multiband Compressor has three independent frequency bands followed by three compressors based on the Sonoris Compressor. The three bands are created with special designed filters to avoid phase cancellation problems. These filters are known as Linkwitz-Riley crossover filters and have a very natural, analog like quality. By design they mix back flat. They don’t introduce delay and are more efficient in use, unlike linear phase filters. Transparency can be achieved by selecting auto-release and opto envelope emulation together with two soft knees. If a more warm sound is needed you can, for example, choose RC envelope emulation with a harder knee. The Sonoris Multiband Compressor has three high resolution gain reduction meters and a transfer graph so you can actually see what you are doing. The ratio is allowed to be lower than 1 so it’s also an expander. Maximum ratio is infinite. The individual bands can also set to limiting, what results in a multiband limiter. 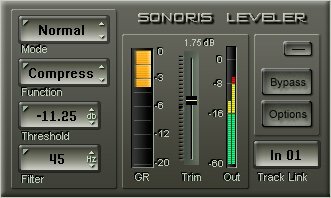 The output section of the Sonoris Multiband Compressor also features a limiter. This guarantees that the output will never exceed the 0dB point. This limiter can also be used as an effect to warm up a signal. 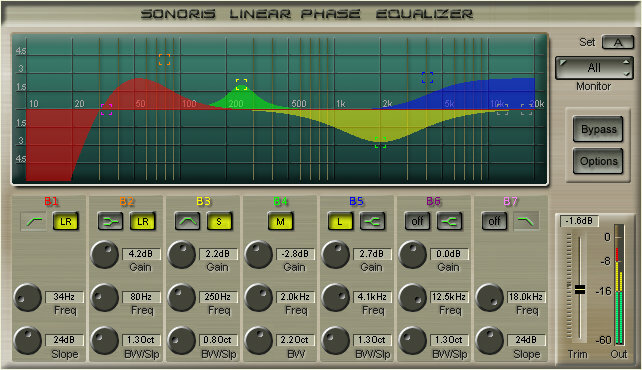 The Sonoris Multiband Compressor is able to process one channel only. With this feature, in combination with the Sonoris MS Codec, it is possible to perform very powerful processing in the MS domain. o jeden z nejlepších multiband pluginů na trhu vůbec. 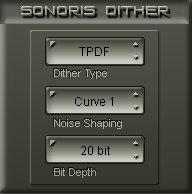 / One of the best multiband plugins on the market.